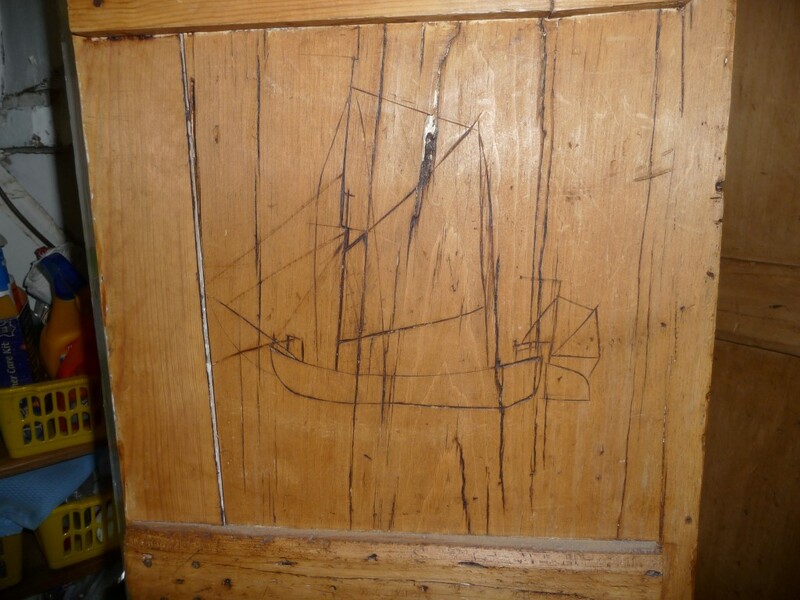 Rough carving found on the under stairs cupboard door. 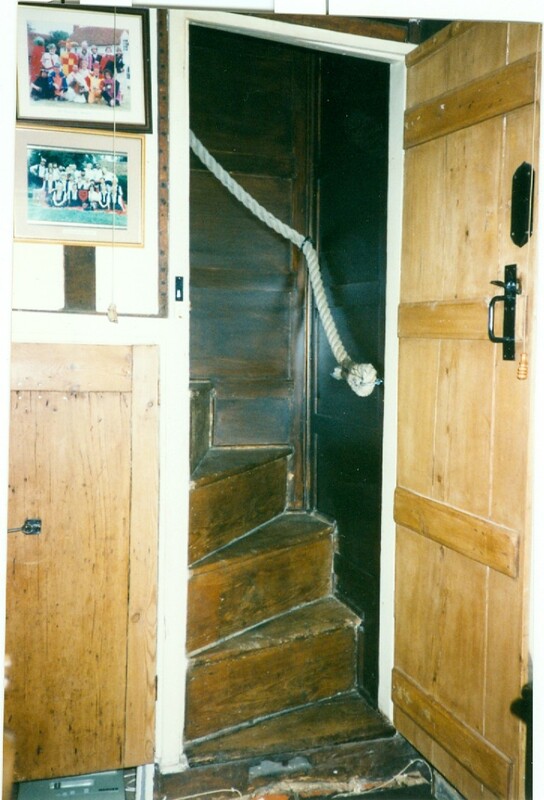 Stairwell, with traditionally reefed rope bannister rail. We bought ‘Ravenswood’ from Brian & Iris Park in January 1990. When we took over the cottage, Brian put together the following history of the house as far as his research had established. We have continued Brian’s work in making ‘Ravenswood’ a family home whilst retaining and enhancing its many “original” features so I have added my own update at the end in the hope and expectation that it may be passed on to those who will, someday, follow us. I acquired ‘Ravenswood’ in 1976 when it had lain empty for nearly twelve months. It had been vacated by a Mr. Hurst who lived there with his wife and, I believe, 5 children. There was a mains toilet directly to the rear where now grows a pine tree. Across the rear of ‘Ravenswood’ there was a ‘lean-to’ conservatory, a sorry, bits and pieces place with several layers of floor, each one inch deep! Along its western side was a poor, 4½” brick wall, subsequently totally rebuilt to 9” thickness, that retained a foot or so of soil all piled against the cottage wall. Over the years this had harboured damp and subsequently the oak sole plate, mounted on simple brick foundations, had virtually rotted away. This explains the sloping ceiling effect along one side of the property viewed from inside. On its eastern flank the cottage had had a lean-to section added in late Victorian times to form a Café: I can remember vaguely being taken in the Cafe by my grandfather, probably while Essex Way was being built and having a Sunday morning cup of tea. 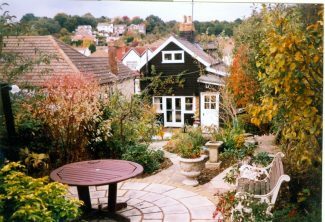 When we purchased ‘Ravenswood’ it had 2 front doors: the existing one and the ex cafe one directly where the lean-to joins the main cottage. The cafe had long ceased to exist; the lean-to part was used by Mr. Hurst as an ‘antique store’: he dealt in junk and old furniture and repaired clocks in the 3 sheds at the bottom of the garden. ‘Ravenswood’ was built in approx. 1730 -1750 as a pair of farm or fisherman’s’ cottages; the date was estimated by a chap who purported to be associated with the Essex County Historical Society. He gave his opinion on the evidence of the duality and size of the brickwork in the chimney and an examination of the first floor joists. When originally constructed the pair consisted of 1½ rooms up and 1½ down in each. Upstairs one can follow the layout easily. Downstairs the rear reception room is now all of the 1½ “down” of one cottage. The lounge part which has the fireplace was the 1 reception or parlour room of the other cottage, the hall and an offshoot formed the ½. At this time, of course, the lean-to cafe did not exist. One can see how we included parts of this lean-to into other areas of the house, as it exists today. Only one small give away remains of the café’s Victorian ancestry: the boarded ceiling seen within the utility room. When used as two cottages entry to upstairs was by ladder: looking at the ceiling beams in the hall and S.W. corner of the dining room one can see a segregated area. Because the whole western wall was thickened up with blockwork after renewing all the timbers the ladder apertures are now 9″ less than previously. The filling in of these “ladderways” was done under the toilet floor by the inclusion of a small door complete, as I recall, with large keyhole! 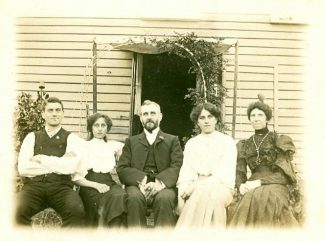 So presumably 2 families lived in the two cottages for about 100 years to mid 19th century. During the summer months, London’s East End descended on both Tilbury and Southend to partake of the pleasures of Steamboat journeys. The London, Tilbury and Southend railway reached Benfleet in 1856 and Southend shortly thereafter; it is supposed to be the first railroad built for passengers rather than freight. This is probably true as this railway company built a large part of central Southend around this time between Westcliff and Southend Central to encourage people to settle in the area and use the railway for work in the City. During the summer months, London’s East End descended on both Tilbury and Southend to partake of the pleasures of Steamboat journeys. These went from Tilbury to Southend and on to Margate, Herne Bay and Clacton. The railway reduced its fares over many years to encourage more passengers and ever more revenue. The financial story of the LT&SR is yet another story. Many people and families dropped off at Benfleet to visit Canvey Island, then a very small community only swelled when the London Dandies floated down from the city to promote bare knuckle fights near the Lobster Smack. Canvey became a picnic outing site to alternate with a seaside outing. From Canvey one has a beautiful view of the Benfleet Downs and Hadleigh escarpment as well as Hadleigh Castle. This ruin was quite a bit bigger than today as shown in Constable’s famous landscape. The Castle therefore became yet another favourite picnic area. Now back to ‘Ravenswood’. It’s not difficult to imagine quite a crowd of “picnickers” who had got off at Benfleet Station during the morning; walked up East Street past ‘Ravenswood’ to Hadleigh Castle: the footpath is there today. Equally imagine hot summer evenings with tired parents and fractious children making for Benfleet Station. What better than a tearoom within striking distance of the train? I’m sure that’s the reason for ‘Ravenswood’s’ hostelry. There was also a small cottage shop only two hundred yards down towards Benfleet Station. Talking of doors, originally there must been 2 outside doors, one has since been lost, unless part of it is the small door under the toilet, the other remains as the existing front door. 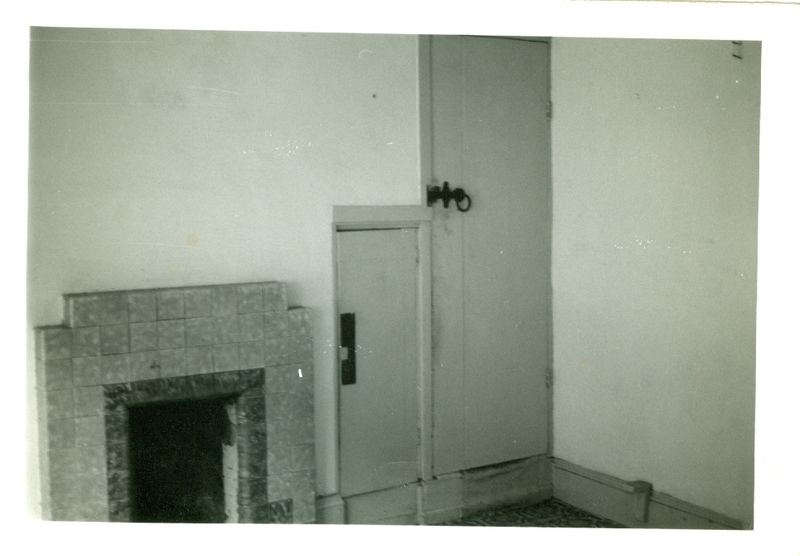 Indoors there must have been 2 normal height doors, one in each cottage, dividing the parlour from the kitchen: I believe these remain; one at the bottom of the stairway and one dividing the two reception rooms. Upstairs originally there were 2 small doors joining the 1 and ½ upper rooms and I believe these remain today exactly where they were originally built.So at some time ‘Ravenswood’ was made as one house and then became a business. When converting the property to one the ladderways were blocked up; a new spiral stairway was built just like thousands of others of their time; standard wind up; more steps in the lower half than top half etc. etc. a cupboard under and, more important, a door at the bottom. During the amalgamation of the 2 cottages the builders broke through upstairs between the two halves and included a new ‘small’ door: in typical Victorian fashion they constructed the existing bathroom door: vertical boarding, quite heavy, with Victorian hinges; very attractive. The first floor doors are small so as to give access between rooms without breaking the tie beams across the width of the place. The tie beams are actually very important and effectively hold both long walls together or apart. Note the iron couplings which tie the chimney breast to these beams, all good blacksmiths bespoke work, as indeed are the arch springers on the ground floor fireplaces. The local blacksmiths shop incidentally was on the car park between the Hoy and Helmet and the church steps. When we bought ‘Ravenswood’ all rooms, except the antique store, were totally plastered with lath, horsehair and lime plaster. Having decided to get to the core of the house all laths and plaster were removed and hundred weights of hand made clout nails were withdrawn from the timbers. Interestingly all beams, floor joists etc. within what was the smaller rooms downstairs had been white-washed over a great length of time, probably the initial 100 years from c.1730. Strangely, the state of the timbers that had been whitewashed was different from the rest; they seem to have lost the sawn effect and have become quite smooth. In the rear reception room we had to support the first floor as when years ago gas lighting was introduced the contractor had merely upped the first floor floorboard, sawn the top out of a run of beams, introduced the gas pipe and relaid the floorboard! We discovered this, removed the offending gas pipe etc, put in the supporting beam and presto, the first floor ceased to be a trampoline! At various places between dining room and the kitchen and between the original and lean-to parts of the lounge will be seen in the floor the original sole plate, still in good condition, unlike its opposite member which, as described above, had rotted away. Although the small ½ rooms on the ground floor were presumably the kitchen, or preparation areas, cooking took place in the larger downstairs rooms, hence up the lounge fireplace will be found the original chain which was used to suspend the various kettles and cauldrons used then. While restoring the property we found a number of half thickness bricks; these were introduced into the lounge hearth, although one cannot see the thickness. 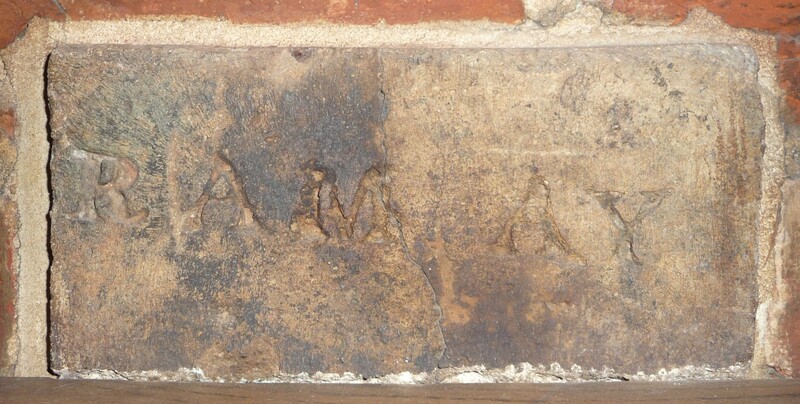 A marked half brick of a yellow colour was found; this is incised with the letters “RAM AY” and has been set in over the dining room chimney. Because of all the work having to be done, new foundations were introduced from the North West corner of the cottage all round and as far as the join between the lean-to and the main cottage on the frontage, in fact all but about 10’0”. All windows were renewed on the Western side to original pattern, the remainder simple casements during 1979 except for the lounge westerly facing one, this was screwed up and faced over so as to remain “original” for as long as possible. The hall/lounge door that existed in 1976 was of hardboard, cellular construction and was burnt on Nov. 5th, being replaced by a real Victorian door ex Midland Railway being a Midland terrace railman’s cottage door c1875, which has a lot akin to the upstairs Victorian door. The aforementioned expert on old houses did point out an interesting feature upstairs. The eastern “gutter line” timbers were used as the ruler for the construction of ‘Ravenswood’. One can see a rough saw line cut at intervals along this beam. This was used as the builders rule: 7 high x 16 long etc. When all was prefabricated these ‘rulers’ were built in to the last sections hence they ended up where they are. 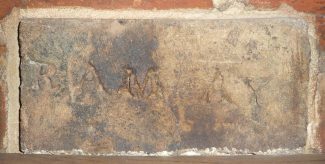 In connection with builders marks, some can still be seen where the two parts of the lounge still have skeleton timbers: marks “111”, “1V”, “V” etc. can be found. In these timbers there remains on what was the outside (before the cafe lean-to) great gouged out holes. These are the result of us removing all the soft, rotten wood from areas that had nails driven through the old outer shiplap into these uprights. Obviously the nails had split the shiplap and water penetrated via the nails to rot parts of the timbers. It’s all history, folks! 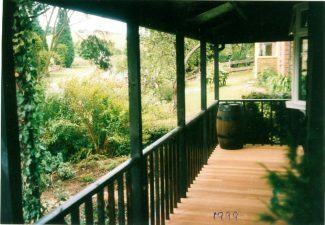 The expert claimed that a lot of the timber was elm end and the secondhand ‘gutter line’ timbers were probably chestnut. An item about the timber framing and various uprights and beams: all the old ones show marks commensurate with being sawn in a pit with two definite angles of cut unlike the new beam which proves to be cut with a circular saw and shows it. The pictures, which go with ‘Ravenswood’, were all taken early this century, i.e. the 19th. The particularly pleasing one is a composite of old postcards which I painted together knowing that one inhabitant of “Brown’s Cottages” opposite was the local laundress; hence all the washing in the front garden. The picture of ‘Ravenswood’, taken from the hill at rear, shows also a cottage nearly opposite: this was inhabited by an old man called Wilkins who was the local horse doctor or vet. 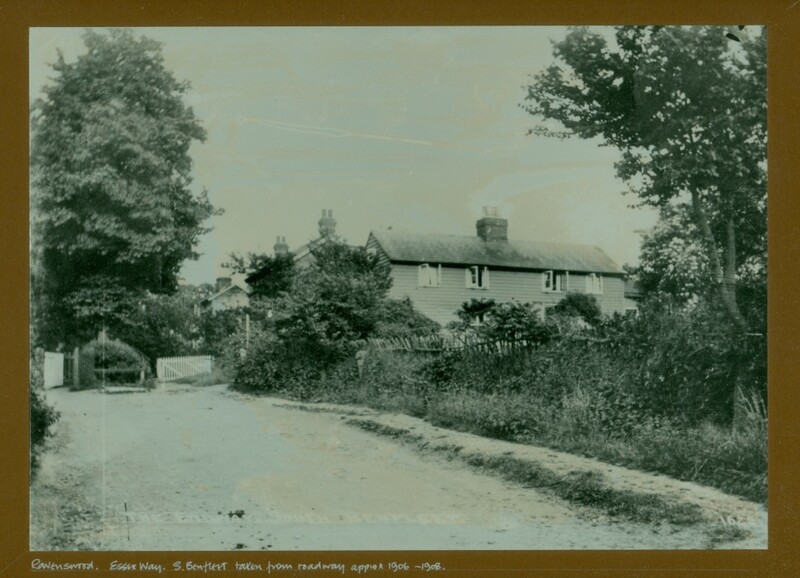 The picture of ‘Ravenswood’ from the road shows the cottage with a gate across the road. There are in local archives pictures of two different gates; they show the boundary of East Street although other properties did exist east of ‘Ravenswood’. East Street became ‘The Endway’ and subsequently Essex Way after the main hill section was completed just pre World War 2. A well was found by the present back door: it had been filled in years before and we used it to contain the fig tree; in theory, fig roots require containment. Old houses sometimes have ghosts or the like! Our only experiences have been the odour of eggs and bacon, or fried smoked bacon filling the night air at 3am. This happened 3 times over the period of a year, twice in winter [windows closed], once in summer. On each occasion, we both experienced the smell and each time I investigated and found no lights or sign of life in any property near us! 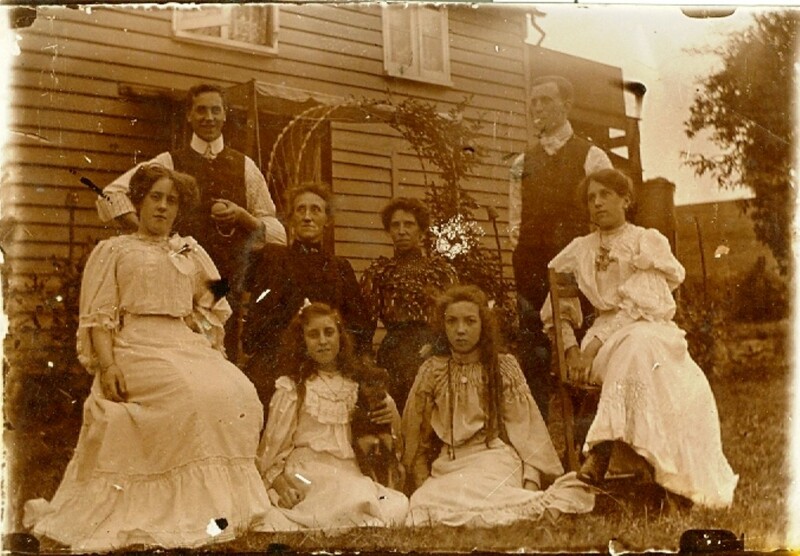 The photos of the Edwardian Family were obtained through Mrs. Bobby Phillips next door who can tell you more as she has a keen knowledge of Benfleet’s history and families. As stated in the Introduction, Brian & Iris Park sold ‘Ravenswood’ to us in January 1990. 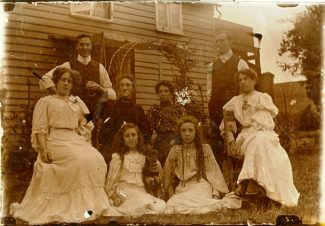 Any reader who knew the Parks may be interested in the fortunes of this ‘old’ Benfleet family before I resume the history of our cottage. 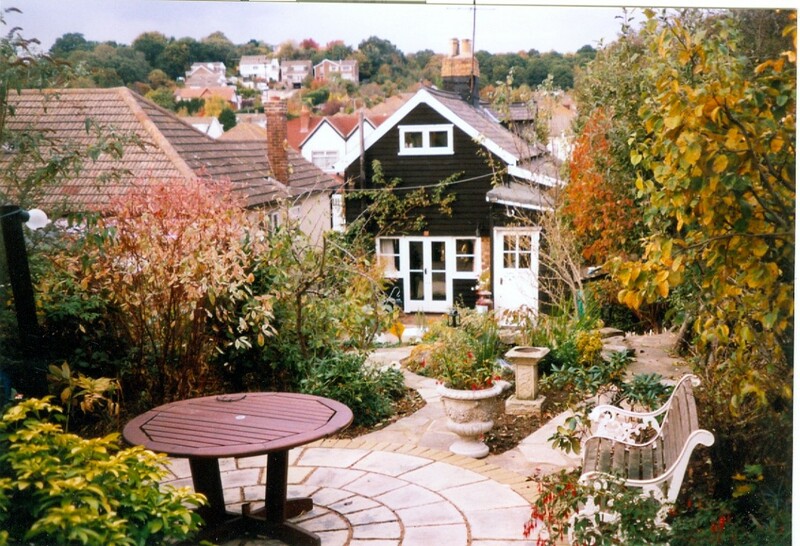 Before moving into ‘Ravenswood’, Brian & Iris lived in Adelaide Gardens, South Benfleet. Brian bought what was, he told me, a “piece of land with a pile of old wood on it”. The “pile” was a collapsed ‘Ravenswood’. On discovering just what he had taken on, Brian and his two sons undertook a 14-year rebuilding programme, much of which is described in Brian’s History. Once ‘Ravenswood’ was habitable, it became Brian’s ‘Office’: his business involved exhibition stand design for Leyland Trucks & Buses and ‘Ravenswood’ saw the creation of detailed drawings for major transport shows all over the world. Brian & Iris moved into ‘Ravenswood’ from Adelaide Gardens shortly before they put it on the market; they had decided to retire to somewhere with “a large garden” and took on the restoration of a magnificent mansion called “Keelings”, exhibiting every period from Tudor to Regency, which came with its own lake and a couple of acres of the designated “Area of Outstanding Natural Beauty” known as Dengie Marshes to the north east of Southminster. 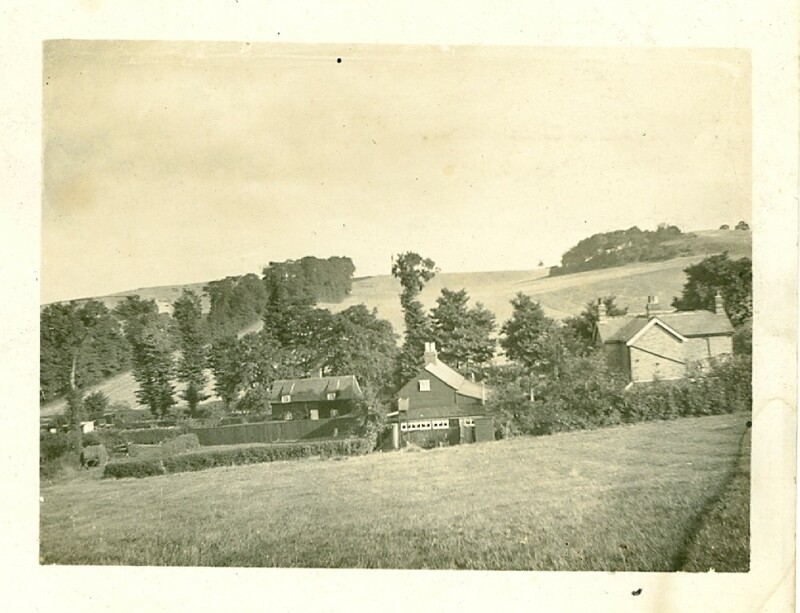 Moving to Keelings was the completion of its restoration but almost as soon as they had settled in, their son, Martin, who was then running a pub between Southminster and Burnham, pointed out that the Station Arms in Southminster was for sale. Brian bought it and started yet another major restoration of a very dilapidated old building, once a 4-bedroom farmhouse with attached barns. The Station Arms, still run by Martin Park with his partner, Maggie, and their two children has been voted “Pub of the Year” by the Dengie Branch of CAMRA for several years: one of my own pewter tankards hangs behind the bar as we still visit whenever we can. Sadly, Brian passed away some 12 years ago; right up until his untimely loss, we held an annual “Ravenswood Dinner” when he and Iris, often accompanied by Martin & Maggie would return to cast a critical eye over our own efforts in carrying on his work on the cottage. 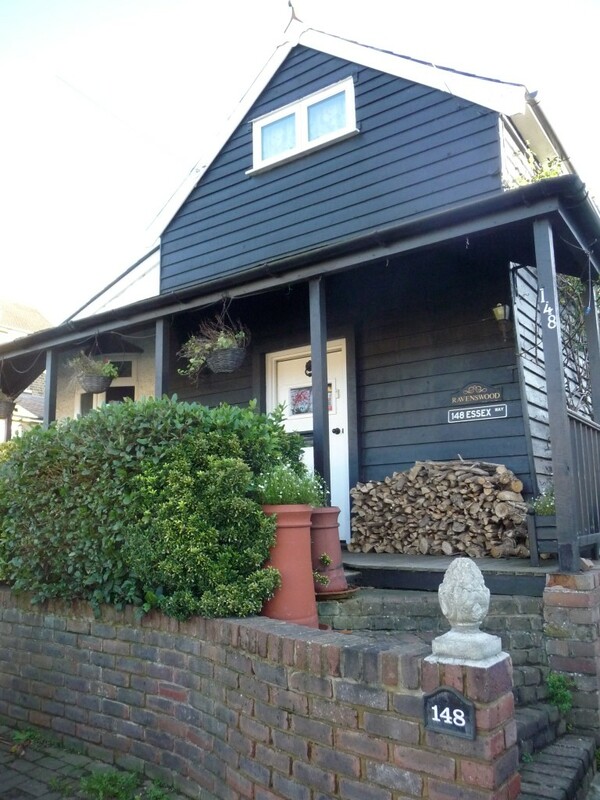 So, that’s the history of this Essex Weatherboard cottage up until we bought it. For the sake of completion I will now bring The Ravenswood Story right up to date. It’s hard to know where to start as we have done so much; I’ll take the house area by area rather than chronologically, though bear in mind that the work outlined below has, in fact, taken us 23 years so far! Being the type of man he was, Brian captured the entire restoration in photographs which, along with those he mentioned above, he passed on to us as “they belong to the house”; we have continued to photograph the work we have done since 1990 to add to the album Brian left with us. The photos he describes are framed and hang on the wall together with a watercolour and a line drawing of the cottage which we later commissioned. The first major upgrade was completed within the first week of our occupancy as we decided a downstairs toilet & shower room was necessary. Our builder erected an extension from the existing ‘back door’, built within the site of the original ‘lean-to’ across the back of ‘Ravenswood’. It is built on two RSJ’s which are embedded into Brian’s new foundations to allow for movement. Very sadly, the extension covered the site of the original well, which we discovered when we removed Brain’s fig tree as a circle of old bricks surrounding rubble. On reflection 23 years later, had we been able to afford it at the time it would have been nice to include a glass panel in the floor so the site could still be seen. Ah well, now we could afford such a luxury the deed is done and the well is only a memory. Our “new” neighbours, Bobby and (the late) Jack Philips, named the extension “The South Wing”; a name that stands to this day. We next turned our activity to continuing Brian’s interior restoration. As the side extension to the lounge, the old café, was erected during the Victorian era, we put in a dado rail and use the walls for a collection of family photographs dating from the late 19th century: all we need is the aspidistra to recreate a Victorian family parlour! One issue on which we disagreed was whether to leave the ‘skeleton’ of outer wall beams of the original cottage which Brian had made a feature separating the old part of the lounge from the extension: I was all for leaving them in place whereas my Wife wanted a bigger room. A compromise was reached by removing half of them so we can still identify where the old cottage ended. Open fires proved a problem; we love the luxury of a log fire though Brian had put in a ‘log effect’ gas fire: that had to go and an old fire grate was purchased at auction. The problem now was that the draughts were all ‘wrong’ for the fireplaces as opening the two cottages into one and adding the staircase upset everything and a fire simply filled the house with smoke! We got around this by putting a log burning stove into the ‘dining room’: the lounge fireplace didn’t seem to suffer the problem too badly (except when the wind blows in a certain direction!) but on occasions we have to wave towels about when the smoke detectors are set off. Looking at the photos Brian passed to us, he had to remove not only old plaster but a “1950’s” tiled fireplace! Also the doors had at least a hundred years of dark brown, gloss paint covering their natural beauty. We removed all the doors and had them all ‘dipped’ to get back to bare wood which we could then wax. Two interesting developments came from this exercise; one was the ‘expert’ who handled the dipping identified the doors as probably 18th century due to the width of the panels. 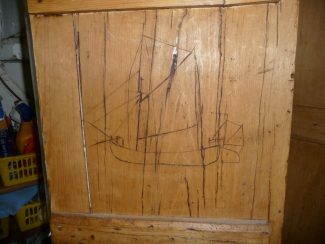 The second was finding on the inside of the understairs cupboard door a rough carving which we have identified as a “Leigh Bawley”, a local type of small fishing vessel. Brian has already mentioned the timbers supporting the roof. These are obviously very long, thick and heavy but they have numerous joints, slots and holes cut into them that bear no relation to the house! We were fortunate to be visited by a gentleman from Essex County Council’s heritage department as well as a friend of ours who then worked as an “inspector” for English Heritage. The considered opinion is that they are from the Tudor period and could be either from an old barn stripped to build the farm worker’s cottages or, possibly, ship’s timbers reclaimed from a vessel in Benfleet’s then thriving harbour. The latter view was supported by other friends from Canvey’s shipbuilding fraternity who identified one of the beams as a “keelson”, the member which in a wooden vessel lies parallel with its keel but above the transverse members such as timbers. We next turned our attention to the floors. Upstairs we hired the necessary equipment and stripped the original floorboards giving them several coats of wax: a bit on the slippery side but well worth it. The mid-Victorian staircase Brian describes emerges through a hole in the floor in the ‘back bedroom’, that is the upper room of one of the two original cottages, so I thought a bannister rail was essential to save anyone falling down it! 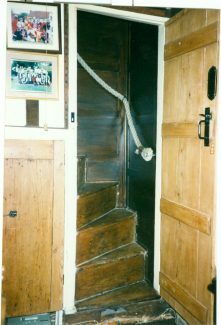 At the same time I built some dark wood panelling into the stairwell and one of our shipbuilding friends fitted a thick rope, properly and traditionally “reefed” at each end, as a stair rail, very necessary as the narrow ‘stairs’ are steep as a ladder. Downstairs, over the concrete floor laid by Brian to replace the original bare earth, he had carpeted the lounge and dining room with tiles from one of his exhibition stands. Very hard wearing but not really our taste so we had a light patterned carpet laid in the lounge. The rear of the house we needed to make more “dog friendly” so we have had almost the whole floor area, dining room and kitchen, covered with dark, uneven flagstone tiles: we got the idea from an old pub, which goes well with my collection of 50 odd pewter tankards, many of which are 19th century, that hang from the ceiling beams! Windows needed our attention next. Brian had fitted a very large, panoramic window right across the back of the ground floor; lovely views but like sitting in a greenhouse as the back is ‘south facing’ and not at all in keeping with the house. In the Lounge extension, he had put in two square picture windows, again each with a single large pane of glass. First addressing the back, we had a specialist restorer build for us two ‘French doors’ with windows to the side; we then got our opposite neighbour, the late Fred Barnes, who had a window fitting business, to replace the extension windows with “Victorian” bays, complete with stained glass inserts. Fred also replaced most of the other windows of ‘Ravenswood’ with double-glazed units; not original but very practical not only for insulation but to reduce the traffic noise from Essex Way! One essential addition was a dormer window in the roof. Remembering that the bedrooms of ‘Ravenswood’ are in the roof with the existing windows almost at floor level, the rooms tend to get very hot and lack natural light so our “restorer” friend built a dormer into the east facing (uphill) roof of the ‘main bedroom’. Finally, on the windows, we have had three “Velux” windows set into the roof of the side extension giving much more light and air to the lounge and kitchen. Again, modern but essential. The walls of ‘Ravenswood’, all except the West wall, which is now wholly block work, retain their “wealth of oak beams” with plaster between and we have maintained their dark stain and off-white colours respectively. In some places, however, Brian had been unable to restore the beams and was forced to plaster right over them. Fortunately, in restoring Keelings, he had a surfeit of old beams and was happy to donate a few to his old home which we had set in place. Some of the major, supporting beams had also been replaced with brick or part-brick columns and these have now been replaced by old railway sleepers (OK, we have cheated a bit by hacking them about to look more ‘original’). We had to call on our restorer friend again when I noticed time, damp and pressure had resulted in a worrying ability to drill holes in the lower bricks of the chimney with a finger! He removed almost all the lower bricks, meaning for a while you could walk through the fireplaces between the rooms; put in a proper damp course and replaced them with more ‘old’ bricks, repointing the entire chimney breasts with ‘lime mortar’. We later got another friend, a brilliant carpenter, to set large shelves above each fireplace, again constructed from old railway sleepers. Brian and Iris, in their haste to complete ‘Ravenswood’ for sale, finished the kitchen with Formica, imitation pine doors and a plastic worktop. It may have looked OK, but it just didn’t seem right. Yet again we struck lucky with our “expert” who, as it turned out, had a pile of original, Victorian stripped Pine that he had purchased when the Southend Engine Sheds had been demolished. He not only built us new fitted doors but refaced part of the wall and built a Welsh dresser to fit into an empty space. The worktop was then tiled to blend in. Staying in the kitchen, being contained within the side extension it was long and narrow and akin to a ship’s galley. We removed the two high-level ovens and the fitted hob unit and took out the plaster from between the beams separating the kitchen from the dining room. This enabled us to fit a large gas range cooker with two ovens and kept everything low level, bringing the two rooms together, in appearance at least, as a kitchen/diner. We had a massive, pine table built to fit so the overall effect is of a traditional farmhouse kitchen. Finally, as far as the interior of ‘Ravenswood’ is concerned, our excellent carpenter/builder friend has now put in a new bathroom for us featuring an “Edwardian” style bath and sink, white tiling and a linen cupboard built into the eaves of the side extension. This was combined with a bit of ‘modernisation’ by putting in a new combination boiler, enabling us to remove the old airing cupboard with its hot water and central heating header tanks. We have never been wholly happy with the exterior of ‘Ravenswood’. I don’t mean the black weatherboard which we love and we believe is truly original and typical of the area, but the plain, blank mass of the frontage, or road-facing end of the house. The Parks had addressed this with a line of conifers which hid the house from the road but, again, made the front rooms somewhat dark. 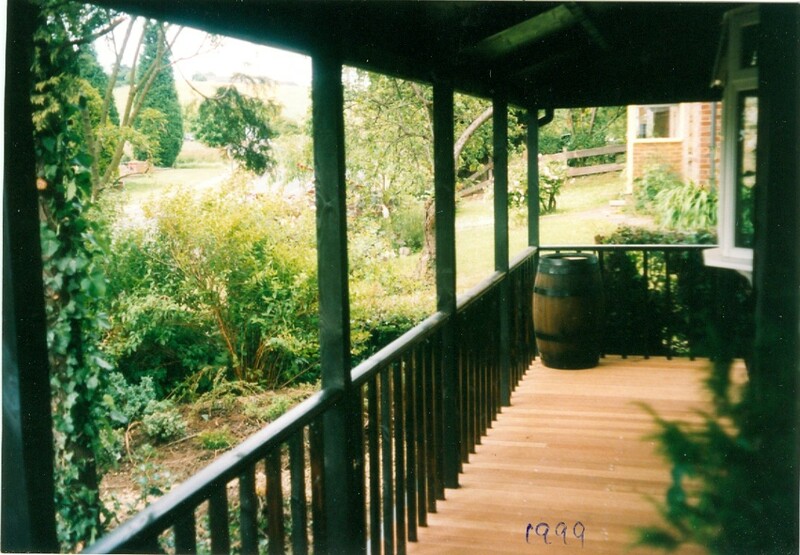 We had these removed and once again, the excellent Fred Barnes stepped in and built a verandah right across the front. We pointed out that he had to make it look good as he would always have to look at it from his own front windows! Naturally, ‘Ravenswood’ was not built with motor cars in mind. 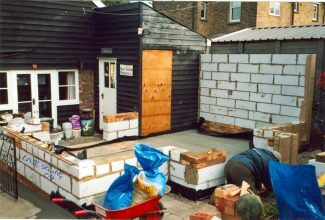 The drive at the West side of the house led to two parking spaces: one extended up the garden and, once again, our builder friend stepped in to create a car port, properly slated of course. The second space was transverse across the back of the house. The latter, of course, restricted the ability to extend backwards. After several years, inevitably I suppose, we came to the conclusion that the house just wasn’t big enough and a conservatory would be the best option. 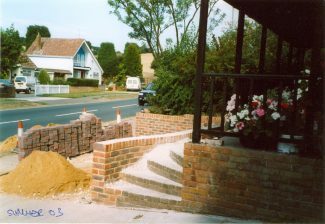 Consequently, we had a parking space dug and paved at the front of the house which released the area at the rear for a large conservatory, designed specially for ‘Ravenswood’. Accessed through the “South Wing”, it created a very nice, small courtyard between the conservatory and the French doors with access to the back door. Bringing the building work right up to date, in September, 2013, our builder removed rotten wood and cracked slates from the extension roof and replaced the whole roof with, admittedly modern but more practical fibre tiles. The down side of living in an old property is, of course, maintenance work such as this. When Brian bought ‘Ravenswood’, there was a line of wooden sheds stretching up the garden towards the field at the back; Brian believed the former owner, Mr. Hurst, used them for his clock repair business. Brian replaced these with a brick, slate roofed outbuilding which became his drawing office and has since been my own office, a garden storage room and is now a combination of my office and a workshop for my Wife’s brother who makes wooden boxes, clocks etc. Brian and Iris would not recognize the garden of ‘Ravenswood’ which they had left as a raised lawn fringed with linear apple and pear trees with a very old apple tree at the top. He had also planted a line of the ubiquitous leylandii across the rear boundary with a passage to a gate into the field. Our development over the past 23 years has created three descending ponds with waterfalls; a round patio in the centre surrounded by shrubs and, most recently a seating area on “astroturf” adjacent to the field with the leylandii replaced by open fencing and a new gate into the field where our dogs enjoy their exercise. Considering the likely origin of ‘Ravenswood’ as farm workers’ cottages, we feel we are continuing a ‘right of access’ to the field and across it to Glyders and to the Country Park that stretches back almost 300 years. So, that’s ‘Ravenswood’. We believe this “Story of a Benfleet Cottage” is an important part of the history of the village from Endway to East Street to Essex Way. It is our commitment to keep it that way: a part of this lovely and historically important area and we hope, when time with us is no more, that our successors will feel the same. I remember this house and the Hurst family very well. The eldest of the children, Bourne, was my best friend at King John School. The next child was Eugene, then Jason, Nicola and finally Russell. Mr Hurst was Bourne’s step-dad, and an antiques dealer, and the house had quite a few of his wares in it. There were a LOT of wind-up gramophone players with big horns on them. They moved to South Wales in 1975 / 76 when they left Benfleet. I seem to remember the back of the garden facing onto fields, and the sight of St Mary’s Church tower seen through trees. There was a rather ramshackle glass conservatory on the back that was the children’s play area. And the rooms were very small with tiny windows! At least it seemed like that to me.